President uses Bond Commission findings as an artillery barrage against Rajapaksa’s SLPP and UNP; wins public support but will it translate into votes ? Never before has a campaign for an otherwise lacklustre local council election in post independent Sri Lanka assumed such national importance or portends to hold the key for the political future of the country. That phenomenon has been enhanced by a number of key factors. Main among them is the report of the Commission of Inquiry into the Central Bank bond scam. President Maithripala Sirisena has been using it as “artillery barrages” in a war to win votes for his beleaguered Sri Lanka Freedom Party (SLFP). That offensive is also aimed at preventingh is party being placed third – an embarrassing task for him to continue as President for the rest of his term.Others mainly in the fray are the United National Party (UNP), the newly formed Sri Lanka Podujana Party (SLPP) and to a lesser extent, the Janatha Vimukthi Peramuna (JVP). There is both good and bad news in this for the President. The good – he has been winning considerable public support as the crusader against bribery and corruption. Yet, whether this will translate into votes at the February 10 polls has to be seen. 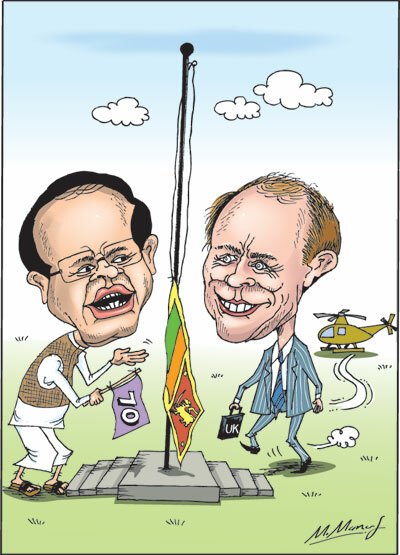 The bad – he has been losing the trust of his coalition partner, the United National Party (UNP) every time he fired strong salvoes at it. The UNP is becoming more distant from him with some UNP stalwarts suggesting they may want to form their own Government. Others are raising the all-important question of how long they could go on. On the other hand, the prospects of a defeat for the UNP, if it is a notable one, no doubt would place Prime Minister, Ranil Wickremesinghe, in a bigger bind. He would be forced to defend his own role as the leader whilst battling it out for his own party over the bond scam where he is also being targeted. All this while, during the two and half years of the ruling coalition, former President Mahinda Rajapaksa has undeniably made some significant strides. He, key members of his family and bureaucrats supportive of him were the subjects of a major presidential and parliamentary election issue in 2015 – over allegations of bribery and corruption. Many cases were highly publicised. However, barring one or two cases, no action was taken. In one case, that of Rajapaksa’s factum factotum, Sajin de Vaas Gunawardene, investigations into his activities have gone into complete limbo. Some believe he is being ‘protected’ by the high-ups of the present government but if at all, whether it is by Sirisena or Wickremesinghe – both, is the question. These days, Rajapaksa and his backers have formed a Sri Lanka Podujana Party (SLPP) and are contesting local polls countrywide. It is no secret that there is substantial voter support for him and his new party. A victory for him would see the return of the Rajapaksas underscoring a new political direction in the country. A loss, however, would only be heavily damaging to them. More than the benefits from a proactive Opposition campaign, that Rajapaksa and his allies have been the beneficiary of omissions, commissions and contradictions of the coalition Government is all too well known. Both Sirisena and Wickremesinghe also met a day after the disrupted ministerial meeting for a discussion at an undisclosed location. The Premier is learnt to have taken upa number of issues related to Sirisena’s utterances. He is said to have pointed out that the beneficiary of all the criticism was the SLPP. They also had a brief one-on-one conversation when Sirisena hosted a banquet for the visiting Indonesian President JokoWidodo. Since then, the duo or their supporters have avoided any pointed references to their leaders. However, Sirisena resumed the attack during a news conference he gave at the Presidential Secretariat on Friday. Sirisena said that the alliance of VIPs who were corrupt met at a house in Borella in Colombo just a night before Parliament convened. The Sunday Times learnt that the reference is to the residence of a businessman, once an MP and who is also now facing charges in courts for criminal misappropriation of state funds. “I challenge these so-called heroes to debate the reports in Parliament at least on a single day before the election. The people will then know who the real thieves are,” Sirisena declared. He later told a news conference on Thursday that the report of the Bond Commission as well as the Presidential Commission of Inquiry that probed specific cases were presented to Parliament on the same day. “Both reports make it clear that there are facts that affect both sides politically,” he added. Yesterday, at Deniyaya Wickremesinghe said that he was prepared to take up the Bond Commission report in Parliament on February 8. It was a clear response to Sirisena’s accusation. However, the remarks raised another serious issue. Chairman of the Elections Commission Mahinda Deshapriya objected to this session on the grounds that it would affect the 48-hour period when political activity and media reportage of them was prohibited. A commission official said he spoke with the Speaker Karu Jayasuriya who said he is yet to receive official intimation from Premier Wickremesinghe. However, he had said he would convey the views of the Chairman to the Premier. Sirisena’s remarks prompted, the Janatha Vimukthi Peramuna (JVP) leader Anura Kumara Dissanayake to write to Speaker Karu Jayasuriya on Friday requesting him to summon Parliament early to debate the Bond Commission report.The JVP was also looking for some political mileage from the report. Jayasuriya has forwarded the letter to Premier Wickremesinghe for action, a Parliament official said. The JVP request is in the light of the disclosures made by President Sirisena. Earlier, party leaders who met on Wednesday decided to hold the debate on February 20 and 21 – after the local Council elections had ended. An SLFP minister said the leader of the ‘Joint Opposition’ in Parliament Dinesh Gunawardena had concurred to have the debate after the polls. Speaker Jayasuriya also discussed with party leaders at that meeting the contents of a letter he had received from Presidential Secretary Austin Fernando. This was in response to queries over the absence of a number of pages in the Commission report. Fernando, according to a Parliament official, had said that this had been done on the advice of the Attorney General since making public some of the portions would impede legal action against those involved. Opposition parties, however, were critical that Sirisena did not explain that fact when he addressed the nation on television on the findings of the Commission report. Q: During election campaign meetings you mentioned that the economy has collapsed. You declared you will take over managing the economy from this year. Could you explain? A: What I meant was not that the economy has collapsed. I spelt out reasons for the collapse. It was not a reference about the current situation, but on what had happened during the past ten years. During the past three years we have taken many important steps to improve the economy. While that process takes place some in the Government deprive the state getting its due revenue. That affects the economy. From the situation in 2015 we have improved. When we took over the government we were already facing sanctions. The EU countries had stopped purchasing our fish and we had lost the GSP concessions for our exports. If I was not elected to power, the World Bank, Asian Development Bank and JAICA would have withdrawn from the country. We have been able to come out from that situation and reach a satisfactory position. Q: You sought an opinion from the Supreme Court about your term of office. You have also been speaking of the fight against corruption. You may run out of time to complete the tasks. Will you be the candidate for the next Presidential elections as the SLFP leader? A: I entered Parliament and became President in an unexpected manner. All former Presidents have either been the Prime Minister or the Opposition Leader. I was elected as the President after being a minister because I did not have an agenda. I became the President in 42 days. What I am doing today is my duty.It is not the time to decide whether I am going to contest the next elections. I have to concentrate on my duties today. There are many challenges which I have to face. I have not taken any decision whether to contest or not. I am not sure from where the current situation will end. It is not a game I am playing. As long as I live I will be engaged in politics. I have been in politics for 50 years. After my presidential term I will remain in politics. (Note: The remarks contradicted his own declaration earlier that he would retire after his first term to his abode in Polonnaruwa). Q: You have called other parties, if possible to agree to a debate in Parliament about the Bond Commission before the Local Council elections. But why didn’t the SLFP ask for a debate? A: The SLFP called for the debate. It is the other parties that wanted the debate postponed. Q: There were reports you intervened in blocking investigations against Gotabaya Rajapaksa (former Defence Secretary). However, Western Province Chief Minister Isura Devapriya has said that the President is taking protective steps in favour of him. Your comments? A: I have instructed the Prime Minister that not only in this case, but in all cases related to politicians steps should be taken to consult senior lawyers when the files come from the Attorney General’s Department to file action. They need to study the case and file it in a manner that it is not rejected. I have told them not to file cases in a manner where they get rejected. For Gotabaya Rajapaksa too the file came to the Inspector General of Police (IGP) to arrest him. The IGP informed me about the file. At that time the Prime Minister was away in India. I told him to hold back the file until the PM returns to follow the instructions given. The Prime Minister returned in two days and he spoke to me. I reminded him about the instructions given and to look into the file again. But the matter ended there. Q: You mentioned about a VIP criminal gang. It is a serious allegation. You mentioned at a public meeting that they were meeting in Borella. Why can’t you expose them through the media by giving details? A: There is such a group. In the future you will have more details about it. Q: In the Bond report is there mention as to how the fraud took place? A: The money has been transferred in cash to another company and from there it has been moved away. In a few days that should come out.I have invited Party leaders or their representatives for a meeting on Monday to seek any clarification about the Bond Commission report, particularly to respond to allegations of pages going missing. Q: Will the differences between the two main parties in the Government affect the preparation of the new Constitution? A: I cannot say anything about it. It is the Parliament (Constitutional Assembly) which is involved in it. Q: You mentioned that some of your directives given in the cabinet were not followed. Does this mean that it is a sign of defiance? Also you mentioned that you never know where things will end. Does this mean there is a threat to your life? A: I meant we should not worry when we take action. Also when we take action the persons who have amassed wealth they can act in different ways. We have examples in Parliament how money can be used to buy over people. I mentioned about the VIP’s ganging together, is a reference to how they can team up for their safety. There can be conflicts over the decision and actions we take. I will serve the people”. Notwithstanding the fact that the Central Bank bond scam has become a political hot potato, the findings of the Commission of Inquiry is revealing in many aspects. Scathing indictments have been made on the conduct of former Bank Governor Arjuna Mahendran and his son-in-law Arjun Aloysius. One of the focal areas of the probe was the highly controversial bond auction on February 27, 2015. The Commission report refers to a “breakfast meeting” held by three Cabinet Ministers with then Governor Mahendran. It said “no request was made at the meeting of the Sub Committee on Economic Affairs held on February 24, 2015) to raise funds at the Treasury Bond Auction to be held on 27th February 2015 for the purpose of paying amounts due on Road Projects or for any other purpose discussed at that meeting.” In other words claims that such large sums of moneys were raised purportedly to pay for road projects was not true. “Mahendran knowingly acted improperly and wrongfully, and interfered in the decision-making processes at the Public Debt Department and, thereafter, at the Tender Board, and directed that, Bids to the value of Rs 10.058 billion be accepted at the Treasury Bond Auction held on 27th February 2015. “The Public Debt Department had intended to accept Bids only to the value of Rs 2.608 billion at this Auction at a Weighted Average Yield of 10.7244 and. after the closure of the Auction, to raise the balance that were required on 02 March 2015, by way of Direct Placements. The Public Debt Department would have had no difficulty in raising these balance funds, by way of Direct Placements, on 02 March 2015. “The CBSL (Central Bank of Sri Lanka) accepted Bids to the value of Rs 10.058 billion at the Treasury Bond Auction held on 27th February 2015 and issued a 30 year Treasury Bonds to the Face Value of Rs 10.058 at this auction, only due to and as a direct result of Mahendran’s aforesaid instruction. “Mahendran’s claim made to the Public Debt Department and the Tender Board that, it was necessary to accept Rs 10 billion to meet additional Government fund requirements, has been demonstrated to be false. “It is disappointing that Deputy Governors Silva and Weerasinghe, who were very experienced officers of the CBSL and bore a responsibility to look after the interests of the CBSL, remained silent and did not counsel Mahendran to desist from that course of action or, at the very least, record their opposition to the direction he issued to the PDD (Public Debt Department). We are of the view that, the aforesaid passive attitude adopted by Deputy Governors Silva and Weerasinghe, amounts to negligence and a breach of their responsibilities as Deputy Governors of the CBSL. “With regard Mahendran’s intervention in the decision-making process of the Tender Board by instructing Deputy Governor Samarasiri that, Bids to the value of Rs 10.058 billion should be accepted, we find it disappointing that, Deputy Governor Samarasiri, who, as the Chairman of the Tender Board had a duty to ensure that the Tender Board reached an independent and considered decision, acted in gross breach of his duty and supinely obeyed the instructions given by Mahendran. “Samarasiri passively negated the whole purpose for which the Tender Board was constituted. We are of the view that, the aforesaid conduct on the part of Deputy Governor Samarasiri amounts to gross negligence and a grave breach of his duties and responsibilities as the Chairman of the Tender Board and a Deputy Governor of the CBSL. “As a direct result of Mahendran’s direction given to the PDD to accept Bids to the value of Rs 10.058 billion, Perpetual Treasuries Ltd. (the company associated with his son-in-law Arjun Aloysius) obtained Treasury Bonds to an aggregate value of Rs 5 billion at Bid Prices ranging from 97.87800 to 91.99280 and Yield Rates (Net of Tax) ranging from 11.5002 to 12.5009, at the Treasury Bond Auction held on 27th February 2015. “Mahendran had to know that, as a result of his direction, Perpetual Treasuries Ltd. would succeed in obtaining Treasury Bonds to the value of Rs 2 billion at high Yield Rates and at low Bid Prices. “It is reasonable to conclude, that Mr Mahendran directed that Bids to the value of Rs 10.058 billion be accepted at the Treasury Bond Auction held on 27th February 2015 for the improper and wrongful collateral purpose of enabling Perpetual TreasuriesLtd to obtain a high value of Treasury Bonds at that Auction, at low Bid Prices and high Yield Rates. “We are of the view that, in the aforesaid circumstances, the Attorney General and other appropriate authorities should consider whether Perpetual Treasuries Ltd is liable for prosecution for an offence in terms of the aforesaid Registered Stock and Securities Ordinance and, in the event of a conviction by a learned Magistrate after Summary Trial, Perpetual Treasuries Ltd could be held liable to a fine equivalent to twice the value of the aforesaid sum of Rs 8,529,964,495/61/- or in such other sum the Court may determine. The Attorney General’s Department has already initiated investigations into the Commission’s findings. As our front page story reveals today, on Wednesday the assets of Perpetual Treasuries Ltd and associate companies, 28 in all, have been frozen by the Central Bank. Arrests of some key personalities by detectives of the Criminal Investigation Department are most likely in the coming weeks. However, the fact that the report of the Commission of Inquiry on the bond issue together with the Presidential Commission on a number of different cases have become a key local polls issue highlighted by President Sirisena. By his own admission, the two reports make revelations of involvement by personalities from “both sides” or more pointedly the UNP and former SLFPers who are now in the SLPP. Thus, he has not only paved the way for the two parties to see eye-to-eye with each other, but also made them arch-enemies. True, he will remain President for two more years. Yet, that would only mean a rough road ahead for him. Whether he is a winner or loser at the local polls, there will be little change in that reality.